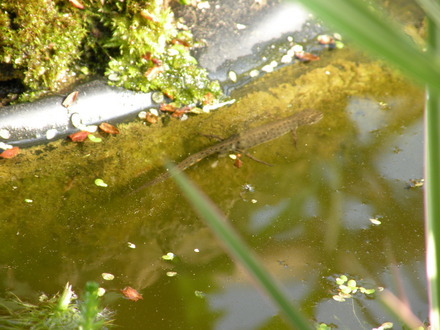 One of many small newts in my pond, the larger ones are camera shy. Frogs, not doing their job to keep the slugs and snails down. Hasn’t it been lovely weather, well it is here in Aylesford. When i got home from work, I went down the garden and found lots and lots of feathers, following the trail …. I found some bones, they were from a pigeon, I was told by my neighbour that the Fox had been visiting the gardens and had been in her kitchen, and not touched the cat nor the cat food. I now have 4 days off work, unfortunately, we have a lot to do in the house as the carpet we ordered last Saturday, and was told that it would take 2 to 3 weeks before it arrived, came 4 days later. It’s just after 4.30pm and i’m going to get the tea started, we’ll eat it in the garden as it’s too nice to eat inside. Lovely to see the newt and frogs. Hope the carpet fitting goes well. Enjoy your meal. I have had a wildlife pond for over two years now. No sign of newts though. Extremely jealous. Great things ponds aren't they? I have newts too and lots of frogs! Its clouding over here (Lincs) forecast rain for tomorrow we could do with some though. Lovely to see the newts, but you need to have a serious word with those lazy frogs. 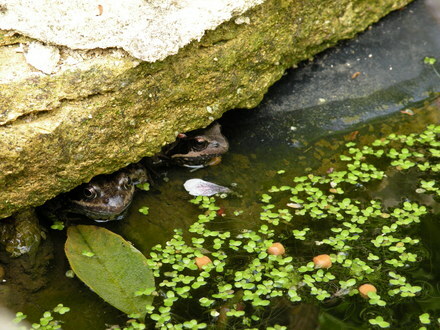 The frogs look to be hiding.....maybe they are getting picked on by the newts!! LOL. Enjoy your tea in the garden Gail. Managed to get the old carpet up Lincslass, I haven't stopped sneezing, dust everywhere. Treesandthi.. If you lived nearer, you could have a couple of ours, I think that we'll be having babys. Sewingkilla, It's very cloudy here today (Sat) just loading the old, old, old, carpet into the car. Great to see your newts Daff ! We have frogs and toads galore but no newts so far ! Maybe one day.... Great photos ! Thank you Bonkersbon, I hope that you do get some newts, You could put a notice in a shop window asking if anyone has any newts that would like a good home. It can take from 2 to 5 years to get them into your pond. You can't take them from the wild, but you can be given them. Great picture of skiving frogs! I saw my first newt today. Really happy. I have waited two years. Lovely pics. We have a pond but it is full of very fat fish so they would probably dicourage newts. We had a frog once which was bright green. We were all excited but it disappeared so don't know what happened to it so will have to content myself with looking at yours from time to time? please!